In the 1970s, researchers at Stanford University performed a simple experiment. They offered children the chance to eat a single marshmallow right now, or wait 15 minutes to receive two marshmallows. Out of 600 children in the study, only about ⅓ were able to wait long enough for two treats. Most attempted to wait, but couldn’t make it through the whole 15 minutes. A minority of kids ate the marshmallow immediately. Feeding marshmallows to children in the name of science may seem like a waste of federal funds. But it turns out that the ability to wait for a treat can actually predict a lot about someone’s personality and life trajectory. Since the 70s, many scientific groups have repeated the “marshmallow test” (some of which have been hilariously documented). In some iterations, researchers recorded whether each child chose an immediate versus delayed treat, and then tracked the children’s characteristics as they grew up. Amazingly, the children’s choices predicted some important attributes later on in life. Generally, the more patient children who waited for the bigger reward would go on to score higher on the SAT, have a lower body mass index (BMI), and were more socially and cognitively competent compared to the kids who couldn’t wait and immediately ate one treat. The “marshmallow test” measures a cognitive ability called delay discounting. The concept is that a big reward becomes less attractive (or “discounted”) the longer you need to wait for it. As such, delay discounting is a measure of impulsivity – how long are you willing to wait for something really good, before choosing a quicker, but less ideal, option? While it’s okay to occasionally have spur-of-the-moment choices, poor delay discounting (increased impulsivity) is often a symptom of problematic gambling, ADHD, bipolar disorder, and other mental health issues. In particular, drug addiction is also accompanied by increased impulsive choices. For instance, drug users will choose immediate rewards (such as drugs of abuse) over delayed, long-term rewards (i.e., family life, socializing, or jobs). Drug users are poor at delay discounting and choose immediate options faster than non-drug users. This isn’t just a human flaw; exposing rats to cocaine also increases their impulsivity during delay discounting tasks. Interestingly, aspects of the “marshmallow test” hint at this impulsivity-drug addiction link. In 2011, researchers did a follow-up study with the (now adult) children from the original 1970’s Stanford experiment. The scientists imaged the subjects’ brains while making them do a delayed gratification task in which they had to wait for a reward. They found that patient versus impulsive individuals had very different activity in two specific brain regions involved in drug addiction. Firstly, the study found that impulsive individuals had greater activity in the ventral striatum, a brain region heavily linked to drug addiction and impulsivity. The greater activity in this region may imply that impulsive individuals process information about rewards differently than patient individuals. That is, the way their brain is wired may cause them to want their rewards right now. Secondly, the impulsive individuals had less activity in the prefrontal cortex, which is responsible for “putting on the brakes” for impulsive actions. This finding suggests that impulsive individuals may not have that neural “supervisor” that can stop themselves from acting on their impulses. Drug addicts show similarly reduced prefrontal activity. So in addition to doing worse on standardized tests, having higher BMIs, or being less socially competent, the marshmallow test predicts that impulsive individuals may have brain activity similar to those of drug users. While it seems like a silly experiment, the marshmallow test is a great starting point to help increase our understanding of impulsivity. Using this information, researchers can start to develop treatments for impulsive behavior that negatively affects people’s lives. Specifically, treating impulsivity in drug addicts could help as part of the rehabilitation process. So think about that the next time you reach for that sweet treat! In my blog post about mitosis (http://www.myscizzle.com/phases-of-mitosis/), I explained some of the challenges a human cell faces when it tries to disentangle its previously replicated chromosomes (for an overview of the cell cycle, see also http://www.myscizzle.com/cell-cycle-introduction/) and segregate them in a highly ordered fashion into the newly forming daughter cells. I also mentioned a protein complex, which is integral for this chromosomal ballet, the cohesin complex. To recap, cohesin is a multimeric ring complex, which holds the two chromatids of a chromosome together from the time the second sister chromatid is generated in S phase until their separation in M phase. This decreases complexity, and thereby increases the fidelity of chromosome segregation, and thus, mitosis/cell division. And while this feat should already be enough to warrant devoting a whole blog post to cohesin, you will shortly realize that this complex also performs a myriad of other functions during the cell cycle, which really makes it “one ring to rule them all”. Figure 1: The cohesin complex. The core complex consists of three subunits: Scc1/Rad21, Smc1, and Smc3. They interact to form a ring structure, which embraces (“coheses”) sister chromatids. But let’s back up a little first. Cohesin’s integral ring structure is composed of three proteins: Smc1, Smc3 (Structural maintenance of chromosomes), and Scc1/Rad21 (Sister chromatid cohesin/radiation sensitive). These three proteins attach to each other in a more or less end-to-end manner, thereby forming a circular structure (see Figure 1; ONLY for the nerds: Smc1 and -3 form from long intramolecular coiled-coils by folding back onto themselves, bringing together their N- and C-termini at the same end. This means that these two proteins actually interact with their middle parts, forming the so-called “hinge”, as opposed to really “end-to-end”). Cohesin obviously gets its name from the fact that it causes “cohesion” between sister chromatids, which has been first described 20 years ago in budding yeast. The theory that the protein complex does so by embracing DNA inside the ring’s lumen was properly formulated in 2002 by the Nasmyth group, and much evidence supporting this “ring embrace model” has been brought forth over last decades, making it widely (but not absolutely) accepted in the field. According to our current understanding, cohesin is already loaded onto DNA (along the entire length of the decondensed one-chromatid chromosome) in telophase, i.e. only minutes after chromosome segregation, by opening/closing its Smc1-Smc3 interaction site (or “entry gate”). When the second sister chromatid is synthesized in S phase, cohesin establishes sister chromatid cohesion in a co-replicative manner (only after you have the second sister chromatid, you can actually start talking about “cohesion”). Early in the following mitosis, in prophase to be exact, the bulk of cohesin is removed from chromosome arms in a non-proteolytic manner by opening up the Smc3-Scc1/Rad21 interface (or “exit gate”; this mechanism is also called “prophase pathway”). However, a small but very important fraction of cohesin molecules, which is located at the chromosomes’ centromere regions, remains protected from this removal mechanism in prophase. This not only ensures that sister chromatids remain cohesed until the metaphase-to-anaphase transition, but also provides us with the stereotypical image of an X-shaped chromosome. The last stage in the life of a cohesin ring is its removal from centromeres, a tightly regulated process, which involves proteolytic cleavage of cohesin’s Scc1/Rad21 subunit (see Figure 2). Figure 2: The cohesin cycle. Cohesin is topologically loaded onto DNA in telophase by opening up the Smc1-Smc3 interphase (“entry gate”). Sister chromatid cohesion is established during S phase, coinciding with the synthesis of the second sister. In prophase of early mitosis, the bulk of cohesin molecules are removed from chromosome arms (also called “prophase pathway”) by opening up the interphase between Scc1/Rad21 and Smc3 (“exit gate”). Centromeric cohesin is ultimately proteolytically removed at the metaphase-to-anaphase transition. As you can see, during the 24 hours of a typical mammalian cell cycle, cohesin is pretty much always directly associated with the entire genome (the exceptions being chromosomes arms during most of mitosis, i.e. 20-40 minutes and entire chromatids during anaphase, i.e. ~10 minutes). This means that cohesin has at least the potential to influence a whole bunch of other chromosomal events, like DNA replication, gene expression and DNA topology. And you know what? Turns out it does! Soon after cohesin was described as this guardian of sister chromatid cohesion, it also became clear that there is just more to it. Take DNA replication for example. There is good evidence that initial cohesin loading is already topological (meaning, the ring closes around the single chromatid). That poses an obvious problem during S phase: While DNA replication machineries (“replisomes”) zip along the chromosomes trying to faithfully duplicate the entire genome in a matter of just a couple of hours, they encounter – on average – multiple cohesin rings that are already wrapped around DNA. Simultaneously, cohesin’s job is to take those newly generated sister chromatids and hold them tightly to the old one. Currently, we don’t really know how this works, whether the replisome can pass through closed cohesin rings, or whether cohesin gets knocked off and reloaded after synthesis. What we do know, however, is that cohesion establishment and DNA replication are strongly interdependent, with defects in cohesion metabolism causing replication phenotypes and vice versa. Cohesin has also been shown to have functions in transcriptional regulation. It was observed quite early that cohesin can act as an insulation factor, blocking long-range promoter-enhancer association. Today we have good evidence showing that cohesin binds to chromosomal insulator elements that are usually associated with the CTCF (CCCTC-binding factor) transcriptional regulator. Here, the ring complex is thought to help CTCF’s agenda by creating internal loops, i.e. inside the same sister chromatid! Studying cohesin has, of course, not only academic value. Because of its pleiotropic functions, defects in human cohesin biology can cause a number of clinically relevant issues. Since actual cohesion defects will cause mitotic failure (which most surely results in cell death), most of cohesin-associated diseases are believed to be caused by misregulation of the complex’s non-canonical functions in replication/transcription. These so-called cohesinopathies (e.g. Roberts syndrome and Cornelia de Lange syndrome) are congenital birth defects with widely ranging symptoms, which usually include craniofacial/upper limb deformities as well as mental retardation. It is important to mention that cohesin also has a very unique role in meiosis where it not only coheses sister chromatids but also chromosomal homologs (the two maternal/paternal versions of a chromosome, each consisting of two sisters, which themselves are cohesed). As a reminder, the lifetime supply of all oocytes of a human female is produced before puberty. These oocytes are arrested in prophase I (prophase of the first meiotic division) with fully cohesed homologs and sisters, and resume meiosis one by one each menstrual cycle. This means that some oocytes might need to keep up their cohesion (between sisters AND homologs) over decades, which, considering the half-life of your average protein, can be challenging. This has important medical relevance as cohesion failure is believed to be the main cause behind missegregation of homologs, and thus, age-related aneuploidies, like e.g. trisomy 21. After twenty years of research, the cohesin complex still manages to surprise us regularly, as new functions in new areas of cell cycle regulation come to light. Currently, extensive research is conducted to better understand the role of certain cohesin mutations in cancers such as glioblastoma, or Ewing’s sarcoma. And while we’re still far away from completely understanding this complex complex, we already know enough to say that cohesin really is “one ring to rule them all”. The WTF Star: Alien Mega Structure or Mega Version of Jupiter System? The Kepler telescope, despite technical issues, has observed over 100,000 stars in our galaxy. Its database is full of stars that show the tell-tale sign of an orbiting planet– a periodic and repeatable dimming of the starlight. But one stellar dimming sequence doesn’t follow the expected protocol and it has astronomers getting creative to explain why. Tabby’s star, or more fondly, the WTF (Where’s the Flux?) star, is a yellow star slightly larger than our Sun located over 1200 light-years away in the constellation Cygnus the Swan. You can’t see it with your eyes but looking through a small 5-inch telescope you can see it just fine. Kepler continuously observed the region of space where WTF lives from 2009 to 2013. Then in 2015, Citizen scientists analyzing the data noticed something very peculiar about WTF’s brightness. In March of 2011, the star dimmed by 22% of its original brightness, suggesting something big was passing in front of it. Then 700 days later in 2013, the star dimmed significantly again, but this time did so irregularly– suggesting that not just one but many large objects were passing in front of the star. This is where the science gets interesting. Light curve for Tabby’s star. When astronomers study the light from stars we create graphs that are called light curves. Light curves describe how the brightness of a star changes over a period of time. We choose a star, take images of it periodically and measure how bright it is. If the star’s brightness decreases, we will record a lower brightness value than in previous measurements. Usually, when a star has planets orbiting it, the dimming will be periodic– tied to the orbit of the planet. So we will measure a smooth dip in the brightness of the star at regular intervals as the planet passes in front. What’s so spectacular about WTF’s brightness is that there is a single, smooth dip in brightness followed 700 days later by irregular but large decreases that lasted for 100 days before the brightness returned back to normal levels. After ruling out issues with the Kepler telescope and the variability of WTF, the lead scientists considered more celestial explanations for the irregular dimming. Debris from a violent collision like the one that formed our Moon would probably create enough large particles to recreate the dimming– but the likelihood of us catching such a one-off event is extremely small. A large conglomerate of comet fragments also seemed like a reasonable and likely cause. But we’ve never observed this before so can only make educated guesses as to what that light curve would look like. Other scientists have jumped in on the task of explaining these dips with suggestions ranging from weird internal variations with the WTF star itself to unfinished alien megastructures. But recently, a group of researchers has proposed an explanation that’s a little more familiar and easily testable. To understand their proposal, we need to discuss a little-known fact (at least, I didn’t know this) about our solar system’s largest planet, Jupiter. All massive bodies in our solar system exert a gravitational force on other massive bodies. If we think of space as a bed sheet held taut at its corners and place a bowling ball at the center, the ball would create a pit or well in the sheet due to the mass of the ball. If we then place a baseball somewhere else on the sheet, the sheet will also bend due to the mass of the baseball. The larger well in the sheet due to the bowling ball will overlap in some places with the well in the sheet due to the baseball. This is sort of how gravitational forces interact with each other. But space is a bit more complicated. The interaction of the gravitational forces of two massive bodies ends up creating what are known as Lagrange points. In our sheet analogy, these would appear as five additional wells created at specific locations around the bowling ball-baseball system. In space, these points orbit the more massive body at the same speed as the smaller body. Any objects living at these points are stuck following the smaller body around the larger one, never catching up or falling behind. In the case of the Sun-Jupiter system, there are three Lagrange points that lie along Jupiter’s orbit and are home to thousands of asteroids. The two large ”Trojan” swarms are located on either side of Jupiter in its orbit around the Sun and the smaller “Hilda” swarm is always located on the opposite side of the Sun from Jupiter. There is evidence for Trojan-type regions in other exoplanet systems and planet formation theory shows that these regions can exist long after planets form in solar systems. So this makes their detection more probable than one-off events like planetary collisions or never observed events like swarms of comet fragments. Researchers in Spain took a known idea and made it bigger to explain the weird dimming of the WTF star. Their proposal suggests the first, smoother dimming event is due to a large, ringed planet– almost five time larger than Jupiter. This large planet would also have larger Trojan swarms which would explain the irregular dips in brightness 700 days later. Since the Jovian system has two Trojan regions, the astronomers expect there to be another irregular dimming episode again in February 2021 which would correspond to the second Trojan region. Then two years later in 2023, the giant ringed planet should pass in front of the star again, starting the approximately 12 year cycle over. Their hypothesis even accounts for a smaller May 2017 dimming event which occurred at the same time their theoretical planet would have been passing behind the WTF star. If this system is similar to Jupiter, the dimming could be explained by a Hilda-like swarm of asteroids which would dim the star but not as significantly as the Trojan swarm. You should still hold some reservations about this prediction though. The number of asteroids needed to produce such a large dimming is huge– like the same mass as Jupiter huge. No one has a clue if this sort of configuration would even be stable. The team is working on a computer model for the system and plans on releasing those results in a forthcoming paper. But the key to a successful hypothesis is that it is easily testable and the Trojan hypothesis gives us something to look forward to in 2021. We only have to wait 4 years to see if these researchers are right or if we need to go back to the drawing board to figure out what’s going on with the WTF star. Curiosity Discovery Suggests Early Mars Environment Suitable for Life Longer Than Previously Thought. We have been searching desperately for evidence of life on Mars since the first Viking lander touched down in 1976. So far we’ve come up empty-handed but a recent finding from the Curiosity rover has refueled scientists’ hopes. NASA’s Curiosity rover is currently puttering along the Martian surface in Gale Crater. Its mission is to determine whether Mars ever had an environment suitable for life. The clays and by-products of reactions between water and sulfuric acid (a.k.a. sulfates) that fill the crater are evidence that it once held a lake that dried up early in the planet’s history. Using its suite of instruments, Curiosity is digging, sifting and burning the soil for clues to whether the wet environment of a young Mars could ever give rise to life. On Tuesday, scientists announced that they discovered evidence that groundwater existed in Gale Crater long after the lake dried up. Curiosity noticed lighter colored rock surrounding fractures in the crater which scientists recognized as a tell-tale sign of groundwater. As water flows underground on Earth, oxygen atoms from the water combine with other minerals found in the rock. The newly-formed molecules are then transported by the flowing water and absorbed by the surrounding rock. This process creates ‘halos’ within the rock that often have different coloration and composition than the original rock. 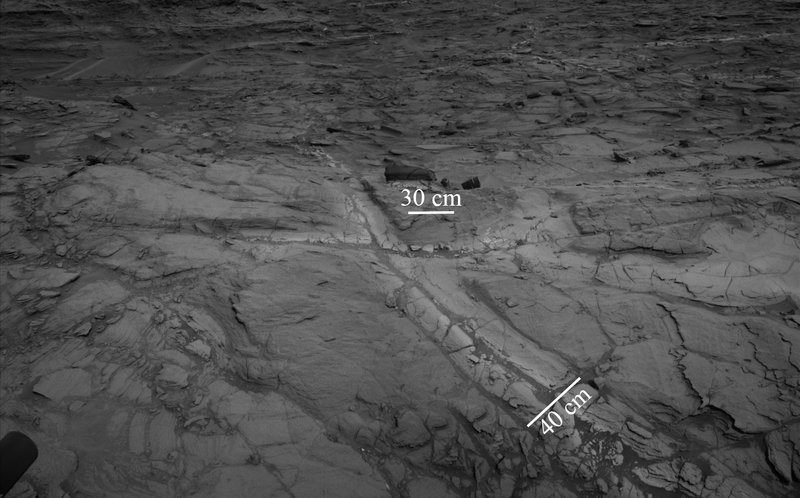 Curiosity used its laser instrument to analyze the composition of the lighter colored rock in Gale Crater and reported that it was full of silicates. This particular region of the crater contains rock that was not present at the same time as the lake and does not contain the minerals necessary to produce silicates. So the only way these silicates could be present is if they were transported there from older rock. Using what they know about groundwater processes on Earth, NASA scientists determined that groundwater must have reacted with silicon present in older rock creating the silicates. These new minerals then flowed to the younger bedrock and seeped in resulting in the halos Curiosity discovered. The time it would take these halos to form provide strong evidence that groundwater persisted in Gale Crater much longer than previously thought. Credit: NASA/JPL-Caltech Image from Curiosity of the lighter colored halos surrounding fractures in Gale Crater. This news also comes on the heels of the first discovery of boron by Curiosity on Mars. Boron on Earth is present in dried-up, non-acidic water beds. Finding boron on Mars suggests that the groundwater present in Gale Crater was most likely at a temperature and acidity suitable for microbial life. The combination of the longevity of groundwater and its acceptable acidity greatly increases the window for microbial life to form on young Mars. These two discoveries have not only extended the time-frame for the habitability of early Mars but lead one to wonder where else groundwater was present on the planet. We hopefully won’t have to wait too long to find out. Curiosity is still going strong and NASA has already begun work on a new set of exploratory Martian robots. The next rover mission to Mars is set to launch in 2020 and will be equipped with a drill that will remove core samples of Martian soil. The samples will be stored on the planet for retrieval at a later date. What (or who) will be sent to pick up the samples is still being determined. Although we haven’t found evidence for life on Mars, the hope remains. It appears Mars had the potential for life at the same time in its formation as Earth. We just have to continue looking for organic signatures in the Martian soil or determine what kept life from getting its start on the Red Planet. A month ago, The Immortal Life of Henrietta Lacks was released on HBO, an adaptation of Rebecca Skloot’s 2010 book of the same title. The book, and the movie, tell the story of Henrietta Lacks, the woman behind the first cell line ever generated, the famous HeLa cell line. From a biologist’s standpoint, this is a really unique thing, as we don’t usually know who is behind the cell lines we grow in the lab. Which, incidentally, is at the centre of the controversy around HeLa cells. HeLa was the first cell line ever made over 60 years ago and today a PubMed search for “HeLa” return 93274 search results. Cell lines are an integral part to research in many fields, and these days there are probably thousands of cell lines. Usually, they are generated from patient samples which are immortalised and then can be grown in dishes, put under the microscope, frozen down, thawed and revived, have their DNA sequenced, their protein levels measured, be genetically modified, treated with drugs, and generally make biomedical research possible. As a general rule, work with cancer cell lines is an easy and cheap way to investigate biological concepts, test drugs and validate methods, mainly because cell lines are cheap compared to animal research, readily available, easy to grow, and there are few concerns around ethics and informed consent. This is because although they originate from patients, the cell lines are not considered living beings in the sense that they have feelings and lives and rights; they are for the most part considered research tools. This is an easy argument to make, as almost all cell lines are immortalised and therefore different from the original tissues patients donated, and most importantly they are anonymous, so that any data generated cannot be related back to the person. But this is exactly what did not happen with HeLa cells. Henrietta Lack’s cells were taken without her knowledge nor consent after she was treated for cervical cancer at Johns Hopkins in 1951. At this point, nobody had managed to grow cells outside the human body, so when Henrietta Lack’s cells started to divide and grow, the researchers were excited, and yet nobody ever told her, or her family. Henrietta Lacks died of her cancer later that year, but her cells survived. For more on this, there is a great Radiolab episode that features interviews with the scientists, as well as Rebecca Skloot and Henrietta Lack’s youngest daughter Deborah Lacks Pullum. In the 1970s, some researchers did reach out to the Lacks family, not because of ethical concerns or gratitude, but to request blood samples. This naturally led to confusion amongst family members around how Henrietta Lack’s cells could be alive, and be used in labs everywhere, even go to space, while Henrietta herself had been dead for twenty years. Nobody had told them, let alone explained the concept of cell lines to them. The lack of consent and information are one side, but in addition to being an invaluable research tool, cell lines are also big business: The global market for cell lines development (which includes cell lines and the media they grow in, and other reagents) is worth around 3 billion dollars, and it’s growing fast. There are companies that specialise in making cell lines of certain genotypes that are sold for hundreds of dollars, and different cell types need different growth media and additives in order to grow. This adds a dimension of financial interest, and whether the family should share in the profit derived from research involving HeLa cells. We have a lot to be grateful for to HeLa cells, and not just biomedical advances. The history of HeLa brought up a plethora of ethical issues around privacy, information, communication and consent that arguably were overdue for discussion. Innovation usually outruns ethics, but while nowadays informed consent is standard for all research involving humans, and patient data is anonymised (or at least pseudonomised and kept confidential), there were no such rules in 1951. There was also apparently no attempt to explain scientific concept and research to non-scientists. And clearly we still have not fully grasped the issues at hand, as in 2013 researchers sequenced the HeLa cell genome – and published it. Again, without the family’s consent. The main argument in defence of publishing the HeLa genome was that the cell line was too different from the original cells to provide any information on Henrietta Lack’s living relatives. There may some truth in that; cell lines change a lot over time, but even after all these years there will still be information about Henrietta Lack’s and her family in there, and genetic information is still personal and should be kept private. HeLa cells have gotten around to research labs around the world and even gone to space and on deep sea dives. And they are now even contaminating other cell lines (which could perhaps be interpreted as just karma). Sadly, the spotlight on Henrietta Lack’s life has sparked arguments amongst the family members around the use and distribution of profits and benefits from the book and movie, and the portrayal of Henrietta Lack’s in the story. Johns Hopkins say they have no rights to the cell line, and have not profited from them, and they have established symposiums, scholarships and awards in Henrietta Lack’s honour. The NIH has established the HeLa Genome Data Access Working Group, which includes members of Henrietta Lack’s family. Any researcher wanting to use the HeLa cell genome in their research has to request the data from this committee, and explain their research plans, and any potential commercialisation. The data may only be used in biomedical research, not ancestry research, and no researcher is allowed to contact the Lacks family directly.